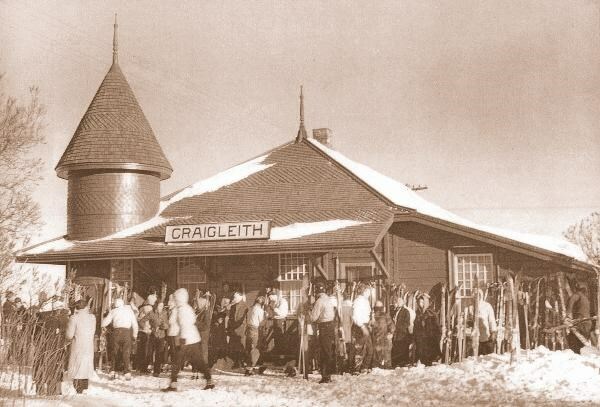 From 1940 to 1960, regular ‘ski trains’ ran from Toronto’s Union Station to the Craigleith Depot, where skiers were taken to Blue Mountain by horse-drawn sleighs. Each weekend, 200 to 300 skiers disembarked at The Depot. It was sometimes a rollicking bunch after partying on the train. Regular passenger and mail service between Toronto and Craigleith ended in 1960, although freight service continued until 1984. In the late ’80s the tracks were lifted and the rail corridor became the Georgian Trail, which runs from Collingwood to Meaford. Today, the fully refurbished Craigleith Heritage Depot is a museum and library. It’s one of the last remaining wooden CNR stations.